The destroyers Shark, Acasta, Ophelia and Christopher formed the submarine screen of the Third Battle-Cruiser Squadron . HMS Invincible turned away from them to avoid torpedoes leaving these four ships to face a heavy attack from a combination of German cruisers and destroyers who set up a devastating rain of fire upon them. Shark and Acasta became very badly damaged. Many of the crew were killed or wounded, and when three more enemies steamed out of the haze and opened fire, Shark's position appeared desperate. Lieutenant-Commander Barron, hoping to get a tow on board Shark, brought his ship Acasta alongside Shark, but Commander Loftus Jones (who outranked Barron), and who had already been wounded, declined to risk the loss of another destroyer and ordered Acasta away. Shark now lay a helpless wreck upon, the water, a target for all the German light cruisers and destroyers, with Loftus Jones and three ratings trying to keep the only undamaged gun in action. As Shark's last torpedo was being placed in the tube, it was hit by a shell and there was a tremendous explosion; yet another shell wounded Loftus Jones, taking off his leg. 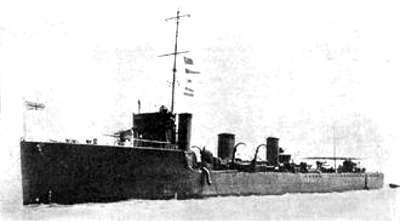 The only gun continued firing until Shark was finally struck by two torpedoes and sank, her colours flying until the end. Six survivors were picked up by a Danish ship next day and Loftus Jones received a posthumous VC. "Acasta was very badly mauled in her encounter with German light cruisers, and was finally so damaged that she lay drifting close to the course of the British battleships. She had a list to starboard, two large holes just abaft the third funnel, one large hole forward on the port side, and sat very low in the water, her guns and torpedo tubes still trained abeam as they had been during the action. As the fleet flagship Iron Duke came rushing by, firing her guns and leading her division, the men of the plucky little destroyer rushed out, forming a line from the forecastle head to right aft, and gave their Commander-in-Chief three hearty cheers. Acasta was afterwards taken in tow by Nonsuch and brought safe to port."